Gorgeous custom with waterfall pool situated on cul-de-sac. Grand entry showcases gorgeous views of pool & cascading staircase. Features hardwood floors, plantation shutters, crown, vaulted ceilings, mud storage area, tons of storage. Split bedroom plan perfect for In-Law suite. Study with vaulted ceiling & built-ins. 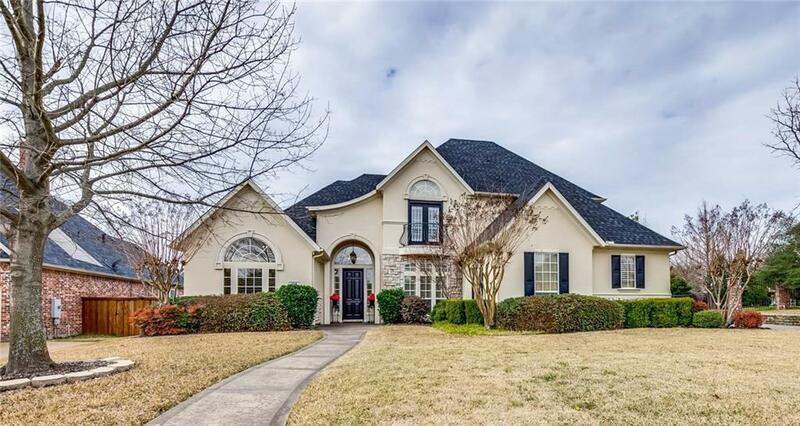 Kitchen offers granite counters, center island, stainless steel appliances, including double ovens, refrigerator, 5-burner gas cooktop & opens to Living Room with built-ins & gas log fireplace. Master retreat with sitting area, split vanities, jetted tub, large shower, coffee bar & walk-in closet. Upstairs game room with cabinets & wet bar. Unwind under pergola overlooking pool, outdoor sitting areas & plenty of backyard space.